Nuclear fusion. Soylent. And now coffee stands?! Mazetti has a background in quirky projects. He and his team once illegally flew into Belarussian airspace and dropped several hundred teddybears carrying pro-democracy messages out of a plane. It caused a diplomatic row that resulted in several generals being sacked. Then, he met his co-founder Maria De La Croix, through a feminist organization. As part of that movement, they protested the average pay gap between women and men by burning the extra wages he hypothetically earned because he was a man. Now, Mazetti, De La Croix and Per Cromwell’s passion is providing the world with an easy, inexpensive way to start a new business that is environmentally sound. They became enamored with the idea of coffee, since it has one of the highest mark-ups of any everyday consumable product. 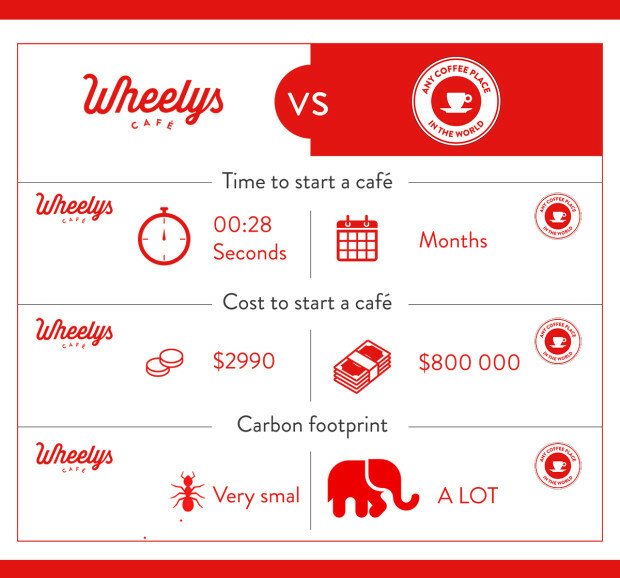 Since launching earlier versions of the Wheelys product, they’ve sold or received pre-orders for about 150 coffee carts to about 20 countries including Jordan, Singapore, Chile and Taiwan. They sell about one or two per day. “In some sense, it’s like the dynamics of a web company but in the real world,” he said. Today, they’re launching a new version of Wheelys. There’s an integrated app to run sales and room for bikes that are 50 percent bigger. A more upscale version includes two Android pads, a mobile greenhouse where you can grow your own coffee beans and an app connected to thermometers showing exact brewing temperatures. If buyers operate under the Wheelys brand, they need to ascribe to the product line, which is all fair-trade and organic. The official menu contains about 30 different items including 10 different kinds of coffee. But there’s still flexibility to adapt to local tastes and needs, Mazetti said. He pointed out that the Wheelys cafe in Jordan does Turkish coffee. More importantly, Wheelys is about pour-over coffee rather than the Italian-styled coffee drinks like lattes and cappuccinos that many popular U.S. chains now use. “If you like the taste of coffee beans, pour over tastes way better,” Mazetti said. He said the big advantage of going with Wheelys versus working for a classic coffee chain was that you get to keep the vast majority of revenues to yourself. If the Wheelys buyer uses the company brand and its suggested product line, then they keep 90 percent of revenue. This is probably bigger than the near-minimum wage a person might earn while working in someone else’s coffee chain. The reason Wheelys can share more of that revenue is because a portable coffee stand doesn’t need to pay for commercial rent for a physical location. Many big cities, though, have food cart licensing fees. “There are 28,000 Starbucks locations in America. There is probably room for at least five more brands like that,” he said. Mazetti estimates that in a decently trafficked location in a dense city, a Wheelys coffee shop might do $400 in revenue per day and keep about $200 after the cost of goods.